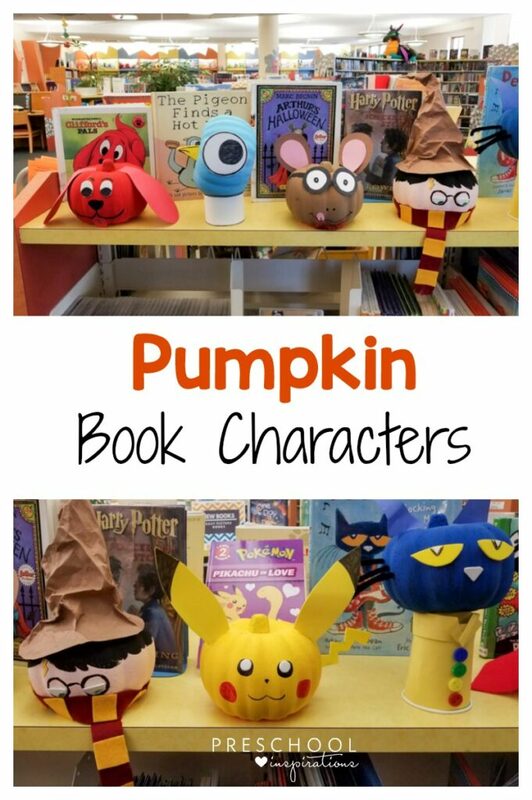 Pumpkin book characters are a fun way to bring stories alive and decorate for Halloween at the same time. Painting pumpkins can be a fun, easy, and safer alternative to carving them around Halloween, especially for young children. 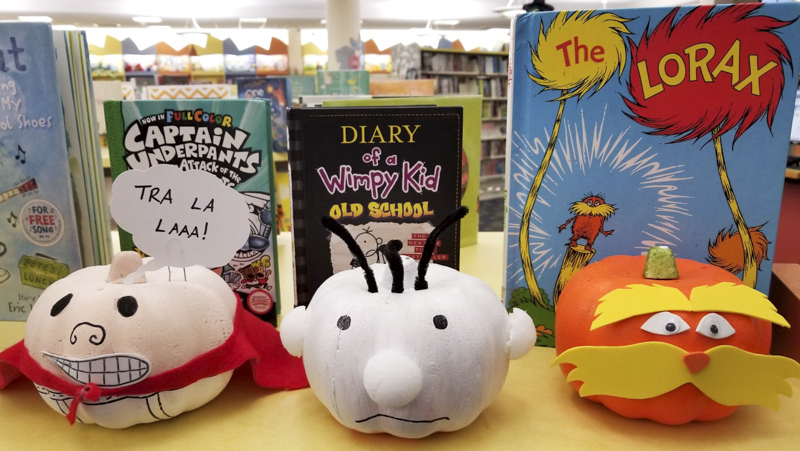 These book character pumpkins are easier to make than they look, and they can be customized in so many ways! This wonderful idea and tutorial came from Barbara, the Children’s Services Manager at Morley Library in Painesville, Ohio. Think of one of the characters from one of your favorite books. Gather your supplies for your pumpkin book character craft and let’s get started. Optional – other accessories such as wiggle eyes, craft felt, pipe cleaners, paper clips for attaching features, etc. Foam carvable pumpkins from The Dollar Tree are a great bargain at $1 each. You could also use real pumpkins, but the foam is a nice alternative since you can use them year after year. First, use a foam paintbrush to apply a coat of acrylic paint to your pumpkin. Depending on the consistency of the paint and the desired color, you may need to do several coats of paint. Make sure to let each coat fully dry. Next, plan out how you want your features on your storybook pumpkin to look. In the examples, some pumpkin characters are just faces, like Clifford, the Lorax, Arthur, the Pigeon, and Harry Potter. Others are entire characters’ bodies, like Captain Underpants, Pete the Cat, and Pikachu. Some features will be easier to draw on, such as eyes, noses, or mouths, while others can be made out of craft foam or construction paper. 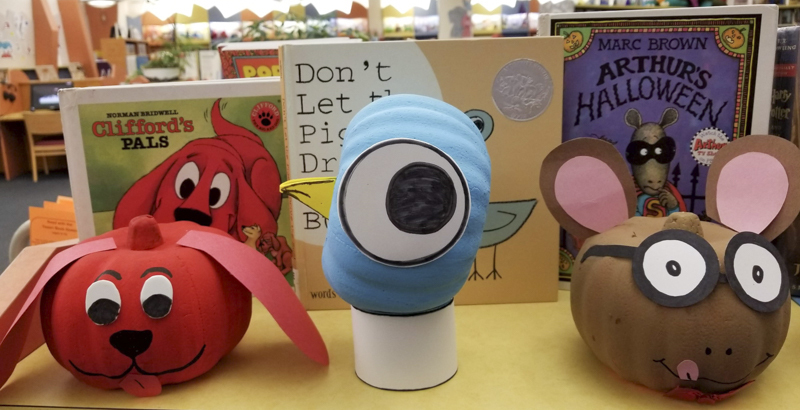 To give it faces and features, use glue dots, double-sided tape, or bent paper clips to secure them onto the book-inspired pumpkin. Be creative – the sky is the limit! For Captain Underpants, I mixed white paint with a touch of pink and orange to get a light peach tone. His eyes and nose are drawn on with permanent marker, and his underpants are painted on with white paint. I used permanent marker to make the stitching detail on his underpants. His mouth is drawn with permanent marker on a piece of white craft foam and affixed to the pumpkin with glue dots. For the cape, I tied together a scrap of red felt. The final finishing touch is a speech bubble with his signature phrase affixed with a bent paper clip and a piece of tape on a piece of white cardstock. For hair and whisker features like the Wimpy Kid and Pete the Cat, simply bend and twist pipe cleaners and stick them straight into the pumpkin. Use supplies you may already have, like paper cups, to make a collar for the Pigeon or a shirt for Pete the Cat, complete with glued-on buttons. For even greater detail, try gluing together a simple cut felt Gryffindor house scarf for Harry Potter or making him a Sorting Hat from a piece of crumpled brown construction paper or a brown paper bag. 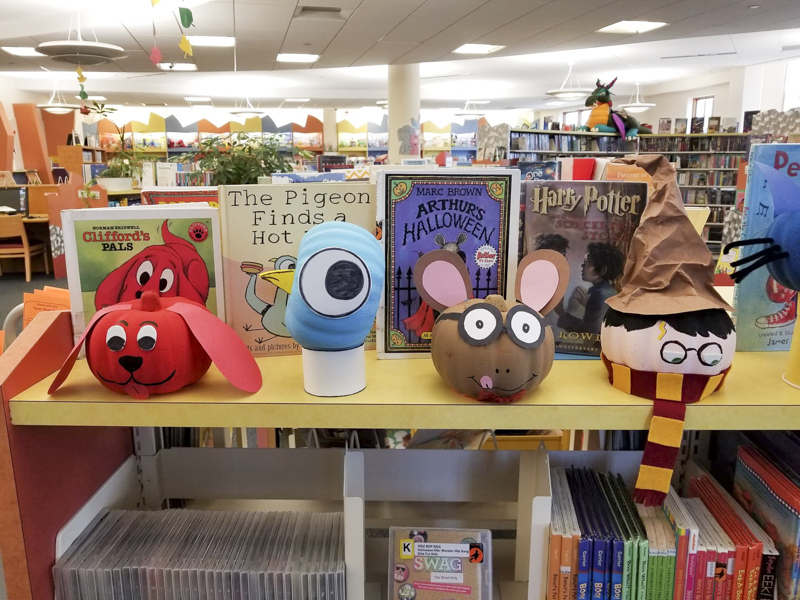 Pumpkin book characters will be sure to delight any book lover this Halloween season, and the possibilities for fun are endless! This is a fabulous idea! 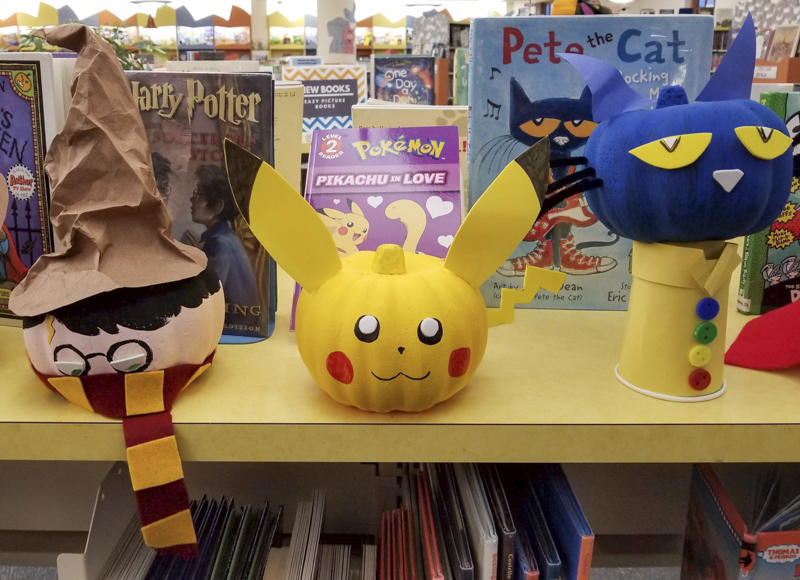 I help with a weekly book exchange at my kids’ school and this will be great to dress up the display for Halloween! I bet they will love it, Sarah!